Villa Lobos: From the Bachianas Brasileiras No., 1 the Preludio Modinha. Dedicated to the memory of Dr. Nabil Azzam's mother, Fairouz Azzam. Cellist Dr. Janice Foy chose this particular movement because of the Bachian spirit and spiritual quality of the melody heard in the Adagio portion. The music was composed by the famous Brazilian composer Villa Lobos, written in 1932. This composition is a very popular one as it was composed by the Turkish composer Sebuh. The Longa is performed by numerous 'ud and qanun virtuosi in Turkey and the Arab World. Tonight it will be performed in a different way. Nabil Azzam has added some themes to the actual setting in instrumentation. Hope you enjoy the outcome. This composition represents a "visit to some sea ports of the Mediterranean." 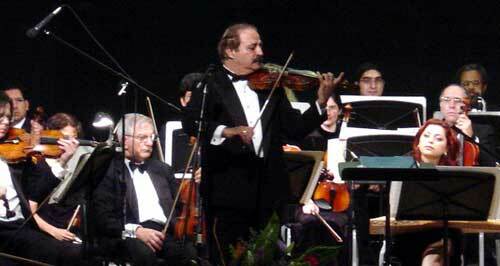 Mr. Shelly Cohen composed the theme that opens the composition which is played between the different songs. The songs are: "Come to Me" from Istanbul (Turkey); "From the Home of the Beloved" from the Greek Islands; "Morning" from Naples (Italy) and "Sephardic Medley" from Andalusia where people representing different ethnicities live together in harmony. MESTO is privileged to have bassoonist Mr. Charlie Gould. 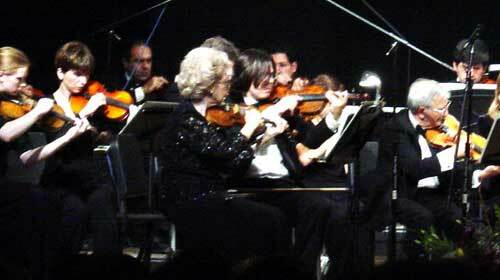 He was in the orchestra that recorded the original music by Maurice Jarre. Mr. Gould tells us the following: "I played first bassoon in the MGM orchestra for twenty years. In 1965 our orchestra recorded the music for Dr. Zhivago with a 110 piece orchestra. It took three months working ten hours a day. There were balalaikas, harps, a big string section, 4 trumpets, 4 trombones, 6 French Horns and double each woodwind instrument. 'Laura's Theme' is so beautiful that it was such a hit all over the world." Tofig Guliyev (1917-2000) was one of the most famous composers in Baku, the capital city of Azerbaijan. He composed music for over thirty films. Tar Virtuoso Mohammad Omranifar performs the song "Sanada Ghalmaz" (This Beauty Won't Last) in an instrumental version which he opens with an improvised cadenza. When `Abd al-Wahhab started his music career his teachers introduced him to mainly Egyptian vocal musical genres. As for instrumental compositions, they were mainly Turkish. `Abd al-Wahhab credited himself with composing what he called "Egyptian instrumental music." His first piece was "Fantasy Nahawand." Later, in 1945 he composed "Aziza" that had an unprecedented success. This piece is still heard today all over the Middle East. Nearly all American belly dancers include Aziza in their dance routines. Novi Sad, a multi-ethnic city in Yugoslavia, is home to Hungarians, Slavs and Roms (Gypsies). Musically, it is influenced not only by these populations but by other European styles, especially Romanian. This suite featuring the mandolin and violin explores the blending of cultures in three movements, each with its own distinct flavor: Hungarian, Serbian and Romanian. The mandolin is a close cousin to a popular Serbian plucked string instrument called a 'tamburica'. This short composition is played by plucking the strings of bowed instruments. This technique is called pizzicato. The first theme was composed in Nazareth back in 1977 and had nowhere to go. A Sunday afternoon stop, however, in Malibu Beach, CA in May 2003 gave the composer enough inspiration to complete the piece. Music critics often argue about a musical style and for good reason. This composition is drawn from the same sphere where the composer hovers; all over the place. With a semi-awareness and total submission to the facts of life, the composer believes that no musical theme can be extremely either authentic or exotic. It is simply an echo of what's inside. The melody of this "happy" music was composed in May of this year as a graduation present from the composer to the lovely young lady Dr. Maribel Khoury, daughter of Dr. Nabil and Raghida Khoury, dear friends of the composer. The second work of Mr. Joseph Chamaa that MESTO has performed. This is another example of a work that sits in the drawer of the composer waiting for the right moment. Our singer, Ms. Joelle Ferrando is the composer's daughter. Composer, Lyricist and singer Elie Choueiry is an exceptional talent from Lebanon. His rich biography is indicative of his musical wealth. Our program tonight includes two of his numerous hits. Raqqast el-Hilween which literally translates to "I made the sweet girls dance to the strings of my `ud" (lute). But because of the conclusion of the lyrics, it was translated as "lonely with the `ud" since after the lover lost his beloved, he could only be consoled by the `ud! Biktub Ismik Ya Bladi (see translation) is one of the most famous works of Mr. Choueiry. It is composed in the maqam (mode) of Rast. This maqam signifies seriousness and dignity among other qualities. Both songs use what are called "red notes" by MESTO; that is, three-quarter tone notes included in the original maqamat Rast and Hijaz. MESTO players are trained to play these intervals which are not found in Western classical music. Khatarna `ala Balak (why did you remember me, oh love? ):Music by Rafiq Hubeika. Arr. Nabil Azzam. This is one of the most famous songs of star singer Tony Hanna of Lebanon. Its wider range requires a strong voice and a high level of vocal technique. Dr. Mansour is one of the few people who can do justice to this song. 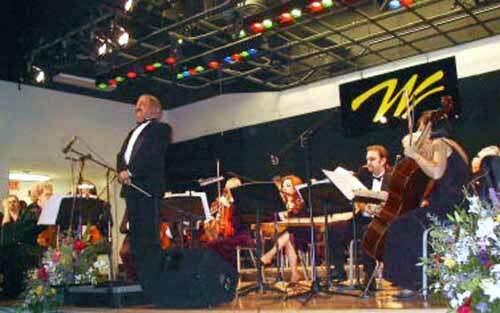 Mr. Tony Hanna often asks Dr. Mansour to sing it for private occasions and at church sponsored events. * Special Thanks to our cellists Dr. J. Foy; L. Belding; C. Cavella; S. Beane and Bassist John Graves for their kind performance with MESTO.